What Does 'Scald' or 'Scalding' Mean? What Does 'Scald' Mean in Culinary Terms? "To scald" or "scalding" in the culinary sense means to heat a liquid until just below the boiling point, 180 degrees, or to blanch fruits and vegetables like tomatoes, for instance, to facilitate the removal of the skin. In older recipes, you will see the term "scald the milk" in the directions. Before pasteurization, milk used in a recipe was scalded to kill microorganisms that can cause disease. Additionally, the whey protein in milk can weaken gluten and prevent dough from rising properly. Scalding the milk deactivated the protein so this didn't happen. So Why Is Scalding Still Done? Since pasteurization has eliminated the bacteria and enzymes, today scalding is used in bread and cake making to dissolve sugar, melt butter and help yeast dough rise faster by starting with warm liquid instead of cold. It is also used to infuse flavors like vanilla beans, fresh mint, lavender buds, cinnamon and more into dairy products to be used in ice creams, pastry creams, and other dessert recipes. More often, though, scalding is a holdover from days gone by. Some cooks say, "I do it because my mother did it." The temperature of scalded milk must be cooled from 180 degrees to 110 degrees before active dry yeast is dissolved in it, otherwise, the high heat will kill the yeast. If you are using instant yeast (which is the same as bread-machine yeast and rapid-rise yeast), dissolving yeast in a liquid is no longer necessary and the scalding step can be omitted. Use a heavy-bottomed saucepan set over medium heat. Stir frequently with a wooden spoon or heatproof silicone spatula. Take the milk’s temperature occasionally. 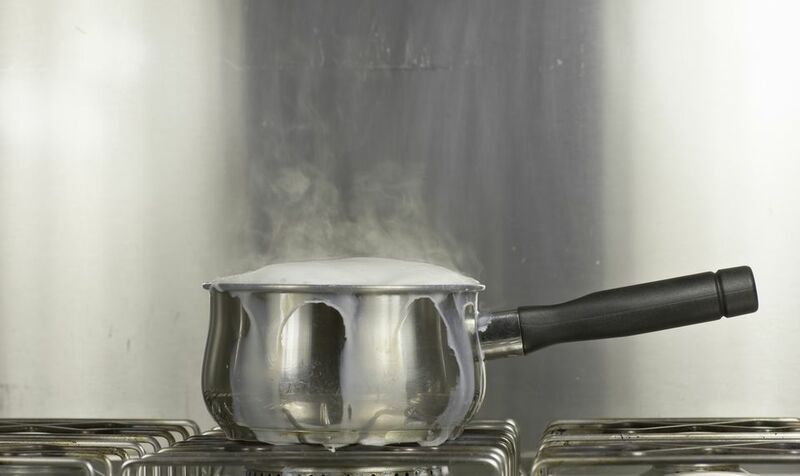 You’re shooting for 180 degrees F.
If you don’t have a thermometer, you’ll know you’ve reached the right temperature when tiny bubbles have formed on the sides of the pan and wisps of steam are coming off the surface. Remove from heat. Cool to the desired temperature and use as directed in your recipe.